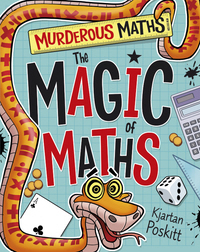 If you've seen Kjartan (the author) talking about the Murderous Maths books, he probably demonstrated some of his different FLEXAGONS. If you want to know more, watch the video! It's time to make your own! 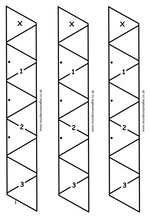 Click on this picture, then when the big version opens up, print it out. Follow the instructions on the video. Good luck! If you are wondering how the little flexagon at the end of the video works, it's a hexaflexagon. 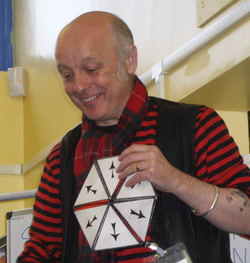 A tri-flexagon has got three different faces, a hexaflexagon has got six! 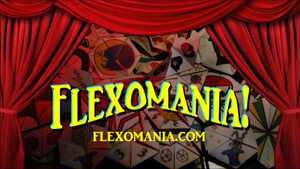 For more flexagon fun including tri, tetra, penta, hexa and hepta-flexagons visit Kjartan Poskitt's FLEXOMANIA!